If you are currently experiencing hair loss, you know it can feel like you are losing a huge part of yourself. Your hair is part of your identity, part of who you are, and losing it isn’t just a sign of getting older, it is something you miss. But hair loss doesn’t have to be the milestone that marks a line you can’t uncross like so many think it is. In fact, there are some great ways to stop hair loss out there and some of them are completely natural. Let’s explore some of the most common hair loss treatments. The foods that you eat and the nutritional profile that you create has a lot to do with hair loss. If you think about it, it makes perfect sense. When we don’t eat right, our bodies don’t get all of the nutrients that we need. Some of those nutrients are needed to maintain hair. Hair is made up of proteins like Keratin, which is the key structural protein in your hair. When you don’t have enough Keratin in your body, your hair becomes thin and dry, and falls out much easier. Eat beans, eggs and leafy vegetables like Kale to keep your Keratin level high. People joke all the time that their kids, career or another facet of their life is making them lose their hair, but most of them don’t know how close to the truth they are. 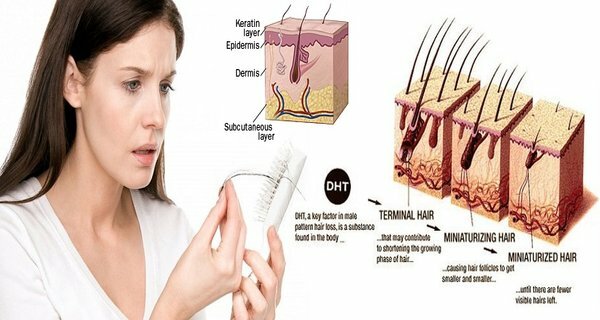 The fact is, stress and anxiety, particularly anxiety that is constant, is a direct cause of hair loss because it makes us unable to regrow hair that falls out. Some of the proteins in our body we create naturally, and others we have to get from our diet. The amino acids cysteine, lysine, methionine and arginine are all amino acids that we have to get from our diet as well as amino acids that help form Keratin. Eating foods that contain those amino acids is essential to preventing hair loss. Omega-3’s are key in preventing the inflammation that prevents hair regrowth. Previous post: Stop Asthma With This Incredible Homemade Juice!